(Nanowerk News) Microscopic ridges contouring the surface of flower petals might play a role in flashing that come-hither look pollinating insects can't resist. Michigan State University scientists and colleagues now have figured out how those form. The result could help researchers learn to enhance plants' pollination success and even could lead to high-grip nanomaterials and "green chemical" feedstocks. "Surprisingly, our work on plant surface biochemistry became a birds and bees and flowers story," said John Ohlrogge, MSU University Distinguished Professor of plant biology. 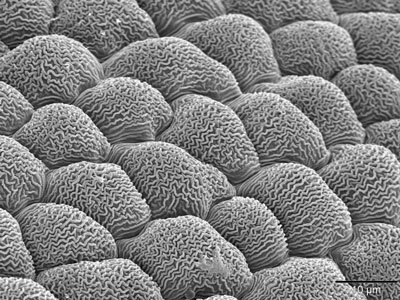 "It's a fundamental property of plant flowers, and we've discovered a basis of how these ridges are made." Known for 75 years, the exact biological function and nature of the flower nanoridges still eludes scientists. They might help pollinating insects grip petals, and retain glistening water droplets that could attract the visitors. Because the ridges' spacing is approximately that of visible and ultraviolet light wavelengths, moreover, some recent research suggests they produce an iridescent shimmer that attracts pollinators. To start, visiting professor Mike Pollard and former Ohlrogge post-doctoral research associates Fred Beisson and Yonghua Li tapped new genetic information to find a mutated strain of the standard research plant Arabidopsis thaliana -- mustard weed. The petals have no such nanoridges because the mutation inhibits production of a polymer that forms the plant cuticle, which separates cell walls from plants' waxy surfaces. Examining the mutant plants' flowers and comparing them to normal mustard plants under scanning electron microscopes, the researchers found that the ridges form from cutin polyester, not from underlying surfaces as some have speculated. How that occurs -- from surface folding or uneven synthesis of cutin polymer across the cell wall, for example, has yet to be learned. But the research will open doors to further research based on cuticular nanostructures, the researchers noted in a recent edition of the journal Proceedings of the National Academy of Sciences. "That could include production of polyesters or related basic chemicals by genetically manipulating plants or microbes" said Beisson, now at Aix Marseille Université in Saint-Paul-lez-Durance, France.